Dogs Trust: Dogs Trust Dogs Day Out. Dogs Trust Dogs Day Out. Hi, my name is Annie and I live at the Dogs Trust Harefield in West London. Recently, me and my canine friends Bridget, Tootsie, Blue, Romeo, Fifi and Puffin went to Hampstead Heath for an outing, and this is our story. We arrived and Kenwood car park and started our walk from there. There were lots of new smells to investigate and it was great to be out in the sunshine with my friends. 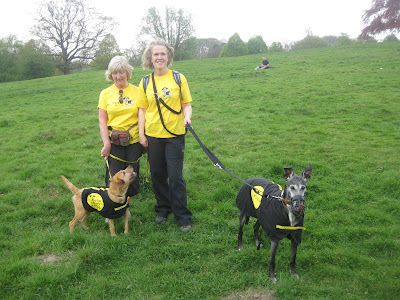 The humans all wore bright yellow T-shirts so that other walkers on the Heath could spot us from a distance. Lots of them came to ask what we were up to and to say hello. Our humans from the Dogs Trust explained that were promoting the work of the charity and explaining how we all need forever homes, and there’s plenty more of us back at the centre. And then we all had our photos taken, photos you can see on this blog. The small tan terrier is me! We walked for a while and met lots of other dogs and their humans, had a sniff and eventually came to a pond. We loved this part! We jumped in, had a paddle, and some of us had a swim, and there were lots of other dogs who joined us, their owners laughing and calling at us all, avoiding the shower of water when we all shook ourselves dry. 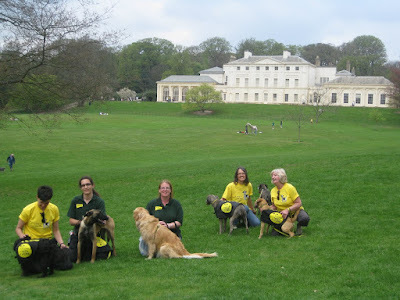 Then we walked up a steep hill towards Kenwood House and we could see the whole of London stretched out before us. The humans really liked it and said it had been there since the 18th Century just as we could see it, but I just sniffed around and hoped to find a discarded ice cream or something to nibble. Romeo and Bridget were getting quite tired at this point so our lead human Anna suggested we find something to drink and visit the café. We had been out walking for a whole 3 hours which was lovely because normally we’re in our kennels for most of our day. Anyway, after a drink, we headed back to our cars and slept all the way back to the centre. It was a great day out and I hope next time we can take some of my other friends who live at the centre, all of them hoping to find their forever home. Here’s some more information about me and my friends in case you would like to come and see us and take us to your home – forever.